In endocytosis, the cell engulfs some of its extracellular fluid (ECF) including material dissolved or suspended in it. A portion of the plasma membrane is invaginated, coated with molecules of the protein clathrin, and pinched off forming a membrane-bounded vesicle called an endosome. results in the ingestion of particulate matter (e.g., bacteria) from the ECF. The endosome is so large that it is called a phagosome or vacuole. This electron micrograph (courtesy of Dr. Robert J. North) shows a guinea pig phagocyte ingesting polystyrene beads. Several beads are already enclosed in phagosomes while the others are in the process of being engulfed. In due course, phagosomes deliver their contents to lysosomes. The membranes of the two organelles fuse. Once inside the lysosome, the contents of the phagosome, e.g. ingested bacteria, are destroyed by the degradative enzymes of the lysosome. Phagocytic cells, like macrophages and neutrophils, are an early line of defense against invading bacteria. However, some bacteria have evolved mechanisms to avoid destruction even after they have been engulfed by phagocytes. Salmonella enterica is a bacterium that causes food poisoning in humans. Once engulfed by phagocytosis, it secretes a protein that prevents the fusion of its phagosome with a lysosome. Mycobacteria (e.g., the tubercle bacillus that causes tuberculosis) use a different trick. When the phagosome is first pinched off from the plasma membrane, it is coated with a protein called "TACO" (for tryptophan-aspartate-containing coat protein). This must be removed before the phagosome can fuse with a lysosome. Mycobacteria taken into a phagosome are able, in some way, to keep the TACO coat from being removed. Thus there is no fusion with lysosomes and the mycobacteria can continue to live in this protected intracellular location. In pinocytosis ("cell drinking"), the drop engulfed is relatively small. A cell sipping away at the ECF by pinocytosis acquires a representative sample of the molecules and ions dissolved in the ECF. But cells also have a much more elegant method for picking up critical components of the ECF that may be in scant supply as we shall now see. Some of the integral membrane proteins that a cell displays at its surface are receptors for particular components of the ECF. For example, iron is transported in the blood complexed to a protein called transferrin. Cells have receptors for transferrin on their surface. When these receptors encounter a molecule of transferrin, they bind tightly to it. The complex of transferrin and its receptor is then engulfed by endocytosis. Ultimately, the iron is released into the cytosol. The strong affinity of the transferrin receptor for transferrin (its ligand) ensures that the cell will get all the iron it needs even if transferrin represents only a small fraction of the protein molecules present in the ECF. Receptor-mediated endocytosis is many thousand times more efficient than simple pinocytosis in enabling the cell to acquire the macromolecules it needs. Cells take up cholesterol by receptor-mediated endocytosis. Cholesterol is an essential component of all cell membranes. Most cells can, as needed, either synthesize cholesterol or acquire it from the ECF. Human cells get much of their cholesterol from the liver and, if your diet is not strictly "100% cholesterol-free", by absorption from the intestine. Cholesterol is a hydrophobic molecule and quite insoluble in water. Thus it cannot pass from the liver and/or the intestine to the cells simply dissolved in blood and ECF. Instead it is carried in tiny droplets of lipoprotein. The most abundant cholesterol carriers in humans are the low-density lipoproteins or LDLs. LDL particles are spheres covered with a single layer of phospholipid molecules with their hydrophilic heads exposed to the watery fluid (e.g., blood) and their hydrophobic tails directed into the interior. Some 1,500 molecules of cholesterol (each bound to a fatty acid) occupy the hydrophobic interior of LDL particles. One molecule of a protein called apolipoprotein B (apoB) is exposed at the surface of each LDL particle. The first step in acquiring LDL particles is for them to bind to LDL receptors exposed at the cell surface. These transmembrane proteins have a site that recognizes and binds to the apolipoprotein B on the surface of the LDL. 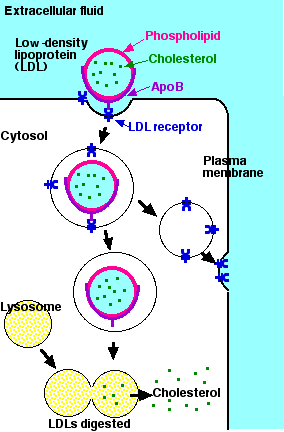 The portion of the plasma membrane with bound LDL is internalized by endocytosis. A drop in the pH (from ~7 to ~5) causes the LDL to separate from its receptor. The vesicle then pinches apart into two smaller vesicles: one containing free LDLs; the other containing now-empty receptors. The vesicle with the LDLs fuses with a lysosome to form a secondary lysosome. The enzymes of the lysosome then release free cholesterol into the cytosol. The vesicle with unoccupied receptors returns to and fuses with the plasma membrane, turning inside out as it does so (exocytosis). In this way the LDL receptors are returned to the cell surface for reuse. People who inherit two defective (mutant) genes for the LDL receptor have receptors that function poorly or not at all. This creates excessively high levels of LDL in their blood and predisposes them to atherosclerosis and heart attacks. The ailment is called familial (because it is inherited) hypercholesterolemia. Mutations in APOB, the apoB gene, cause another form of inherited hypercholesterolemia. and there is growing evidence that, like cholesterol, they are taken into the cell by receptor-mediated endocytosis. Some intracellular parasites exploit receptor-mediated endocytosis to sneak their way into their host cell. They have evolved surface molecules that serve as decoy ligands for receptors on the target cell surface. Binding to these receptors tricks the cell into engulfing the parasite. Epstein-Barr Virus (EBV). This virus causes mononucleosis and is a contributing factor in the development of Burkitt's lymphoma, a cancer of B lymphocytes. It binds to a receptor present on the surface of B cells [Link]. Influenza virus. The hemagglutinin on the surface of the virus binds to carbohydrate on the surface of the target cell tricking the cell into engulfing it [More]. Listeria monocytogenes. This food-borne bacterium can be dangerous to people with defective immune systems as well as to pregnant women and their newborn babies. It has two kinds of surface molecules each a ligand for a different receptor on the target cell surface. Streptococcus pneumoniae. 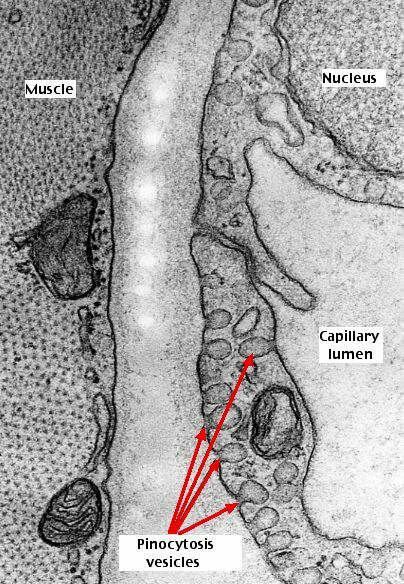 Epithelial cells like those in the nasopharynx have receptors that are responsible for transporting IgA and IgM antibodies from the blood to the apical surface of the cell. The pneumococcus piggybacks on this receptor on its return trip into the cell. This is the organism that led to the discovery that genes are DNA. Link to a discussion. Endocytosis removes portions of the plasma membrane and takes them inside the cell. To keep in balance, membrane must be returned to the plasma membrane. This occurs by exocytosis.